The features you add to your website must accomplish a specific purpose. 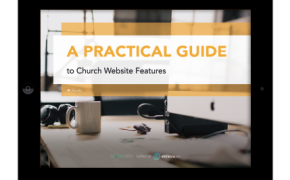 They need to facilitate ministry online, so how do you ensure you’re getting the right ones? Does your church really need a small group finder? Could a mega navigation help people find what they are looking for? Do you need filters and search features on our staff page? Luckily you don’t have to figure this out on your own. If you’re starting a redesign or looking to enhance your website this is a good place to start.